Sound healing therapy uses aspects of music to improve your physical, emotional and psychological health. Healing with sound is believed to date back to ancient Greece, when music was used in an attempt to cure mental disorders. Singing bowl therapy dates back to the 12th century and has been used for meditation and rituals in Tibetan culture. Singing bowls are native to India and Tibetan region. Golden yellow metal bowls produce a deep, penetrating sound that’s used to relax and repair the mind. Tibetan singing bowl is a feasible low-cost intervention for reducing feelings of tension, anxiety, depression, and increasing spiritual well-being. Tibetan Bowl Sound Healing uses these principles to weave a tapestry of toning vibrations that relax the sympathetic nervous system allowing the body to heal. Reduces stress, anxiety, blood pressure and lowers anger. Deep relaxation and pain relief, helps in recovery from illness and traumas. Increase mental and emotional clarity to promote whole body healing. Helps in coping with life challenges and obstacles. How do Tibetan Singing Bowls help in the healing process? All parts of our body possess a different resonant frequency. When any organ, or other part of the body, is vibrating out of tune or non-harmoniously, it is usually called dis-ease. A body is in a healthy state only when each cell and each organ resonate in harmony with the whole being. The sound frequencies created by Tibetan Singing Bowls restore and optimise the flow of energy in the parts of the body where this is required. 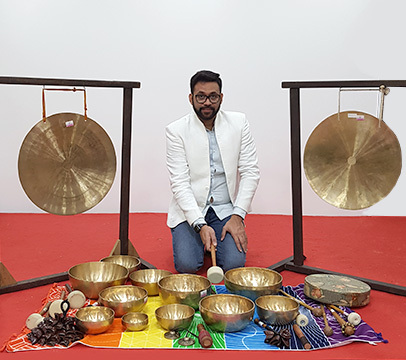 Sound from Tibetan Singing Bowls entrain the brain to move into the Theta brain wave frequencies that induce deep meditative peaceful state and impact our nervous system, engaging our relaxation reflex and inhibiting the stress or pain response. Tibetan singing bowl therapy may be good for your physical, as well as emotional, well-being.